The Baptist Church in Wellington was originally formed in 1807 & they licensed a chapel in King Street in 1808. This chapel was rebuilt & opened on the 21 October 1829 and had seating for 340 worshippers. On census Sunday in 1851 there was an attendance of 60 at the morning service and 100 at the evening service. The chapel was enlarged in 1897. This is the chapel in the photograph. The chapel closed in 1920 when the members joined with the Congregationalists on Constitution Hill to form the Union Free Church. 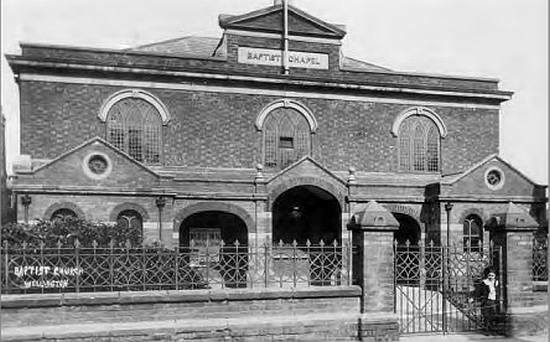 The Baptist chapel was described as "derelict" in 1973.